Ginger, or the Latin name Zingiber officinale, is a common herb. 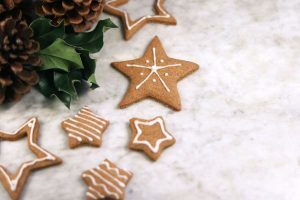 We see ginger as a spice being added to sweets including gingerbread cookies, pumpkin pies, pickled in vinegar or sherry, consumed in ginger tea, candy, soda, sugar or eaten raw on the sides of sushi plates. Ginger produces a hot, fragrant taste and is a well-known spice. The ginger plant itself is a perennial that grows from 1- 3 feet in height. It is in the family that is closely related to turmeric or the Latin name Curcuma longa, and cardamom or the Latin name Elettaria cardamom. Ginger has a long history. Originally grown in the lush tropical jungles in Southern Asia, it is thought to have originated on the Indian subcontinent. Ginger had been cultivated in India and China before historical recording began. The earliest written medical books from both of these countries, discuss ginger, both fresh and dried and their many benefits in great detail. An Ayurvedic text written in approximately the 3rd century BC discusses treatments using ginger. Ginger reached the Mediterranean region with Arab traders over 2,000 years ago. It was brought from India to the Near East and from there, it was sent across the sea and sold to both the Greek and Roman civilizations. Records show that ancient Rome taxed the imported ginger when it came ashore at Alexandria. When the Roman empire fell, ginger and its uses were lost to most of Europe. It wasn’t until the 11th century that Europe rediscovered this spice. Queen Elizabeth I (1533-1603) was very fond of ginger. She is given the credit for the appearance of the now famous gingerbread men cookies seen during the holidays. Medicinal use and research for ginger are far and wide. In studies, ginger has been used for nausea and vomiting caused by seasickness, morning sickness and chemotherapy. Some studies have shown ginger to have a liver protective element, effective in treating osteoarthritis, joint and muscle injury, headache, the common cold and sore throat. The most common uses for ginger are for the gastrointestinal system. Ginger has been used for everything from diarrhea, to stomach pain, gas, bloating, improving gastric motility, constipation and colic. A group of Cornell Medical School researchers published an article in the New England Journal of Medicine in 1980 confirming that ginger completely inhibited the potentially life-threatening process of platelet aggregation. So, the next time you eat a ginger snap or add fresh ginger root to your food, remember how long ago this wonder plant started its journey and how far it has come to make it to your table.